This is the second in an occasional series of articles by local historian, Peter Williams, who specialises in Newham housing, maps and local history. In each he looks, in detail, at the history of particular streets in Forest Gate. See here for Peter's history of Woodford Road, posted earlier on this blog. Peter has complemented his own knowledge by accessing the increasingly digitised national newspapers' collection - which can be found here- and has added extracts from this that refer specifically to the roads he will feature. The reproduction isn't always great, so we have transcribed sections of them. This corner of Forest Gate has a very interesting history. 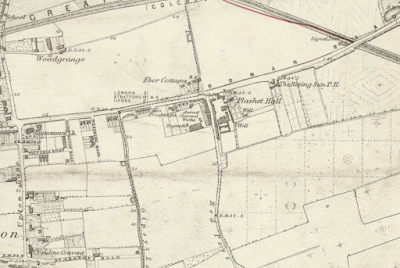 The map below, dates back to 1800, and shows the area considered in this blog as being almost completely undeveloped. The highway running from left to right, at the bottom is what is now Romford Road. 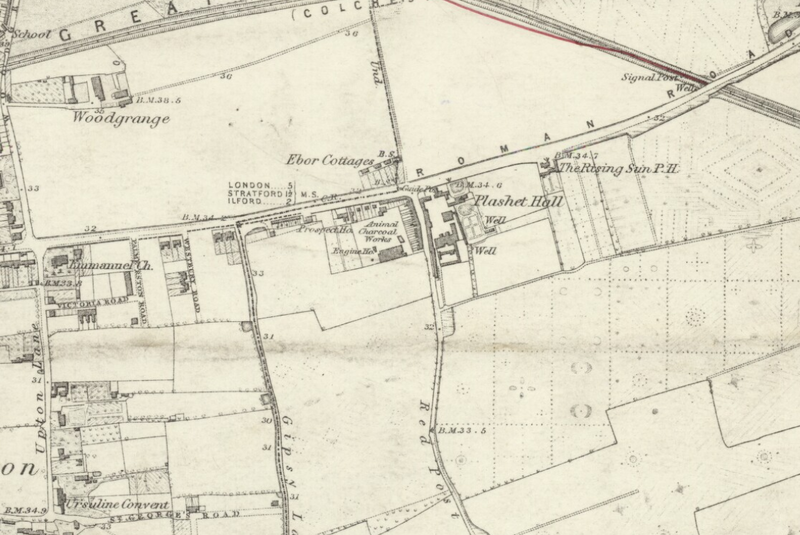 The Eagle and Child pub is clearly marked at the centre, towards the right, and lies on what was then Eagle and Child Lane - now Woodgrange Road. 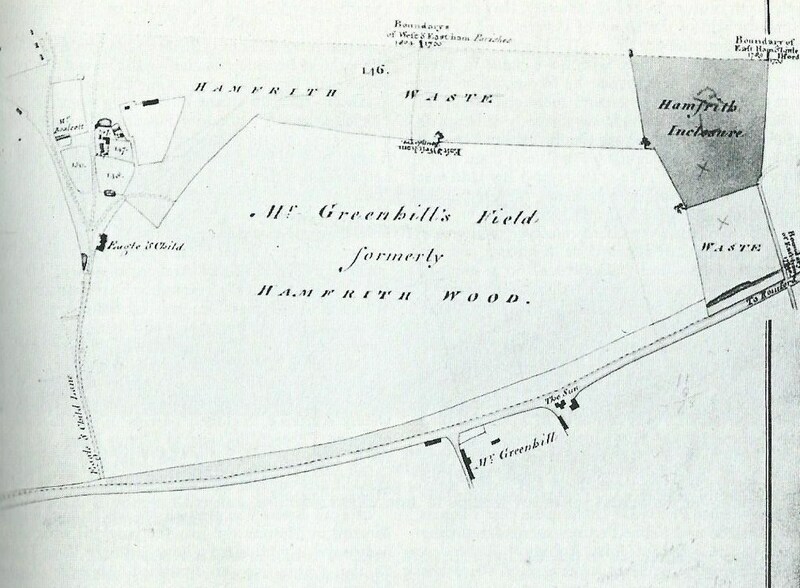 What is described as "Mr Greenfield's Field - formerly Hamfrith Wood" is the land largely occupied today by the Woodgrange Estate. "The Sun" - towards the right of Romford Road, where it meets Shrewsbury Road, is what we now know as The Rising Sun pub. 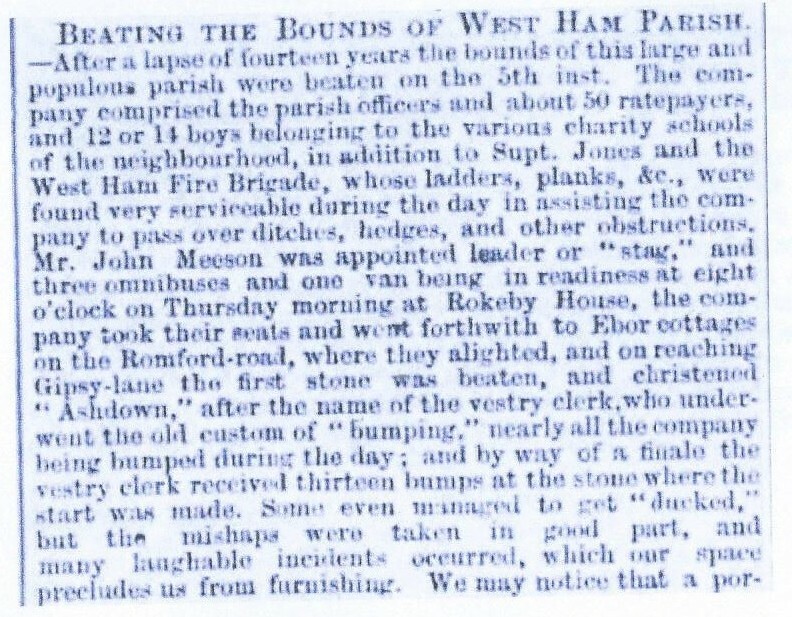 The boundary between West and East Ham is clearly marked on the map, and is considered later in the article, below. The small black mark above "Mr Greenhill" is Plashet, or Potato Hall - also considered later in this article. The small black mark to the north of this, on what is now Romford Road, was "Irish Row", examined below. The road immediately to the right is Katherine Road, which in less sensitive Victorian times was known as Gypsy Lane - presumably because of its proximity to Irish Row. There are a number of features worth looking at. There is the animal charcoal works in the centre. Animal charcoal appears to be something to do with converting ammonia into sulphate of ammonia. This is likely to be a very smelly business. After the Metropolitan Building Act 1844 the smelly, noxious or offensive trades had by law to be located east of the River Lea i.e. they were driven out of metropolitan London into Essex. West Ham ended up with many noxious trades – blood and bone boilers; tallow manufacturers; tanning animal hides; soap and fertiliser works; tripe boilers; animal rendering works (Carpenters Rd area of Stratford was known as stinky Stratford into the twentieth century). Indeed the last one of these factories John Knights in Silvertown only closed in late 2014, and has been prosecuted by Newham council in the last couple of years in effect for making bad smells. They made pet food and soap by rendering down animal carcasses. See here. Engine house on the map will mean the building that housed the steam engine to power the factory. Plashet Hall This house, locally known as Potato Hall, stood on the junction of Romford Road and Katherine Road, seen below about 1890. It was the residence of one of the Greenhill family which farmed the nearby 150 acres of Hamfrith farm. (Greenhill Grove and the Greenhill Centre in Manor Park recall the name). It was also called Potato Hall from the large number of potatoes cultivated in the neighbourhood, see here. In 1796 there were 420 acres set down to potatoes in West Ham parish according to the Victoria County History. 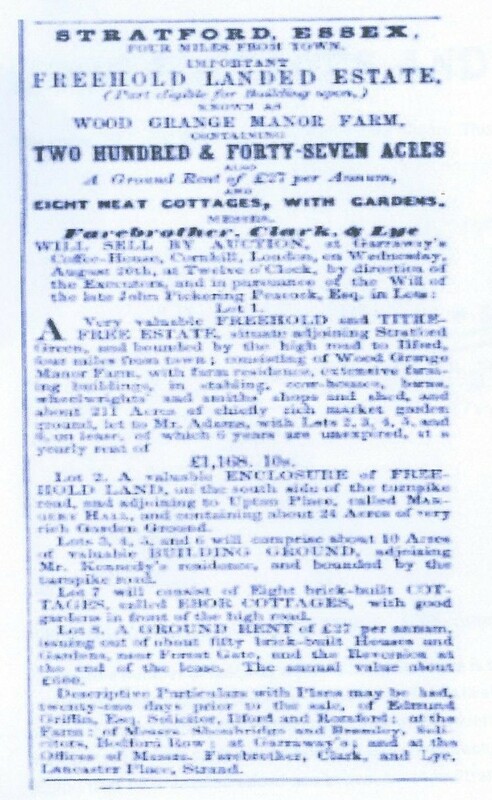 An 1828 parliamentary Select Committee on the police, mentioned that Irish migrant labour was being used to cultivate potatoes in East Ham. The Potato Hall roof was surmounted by an octagonal lantern. This seems to have been a favourite feature in the area, probably because of the view it could command of the River Thames and its shipping, see here. 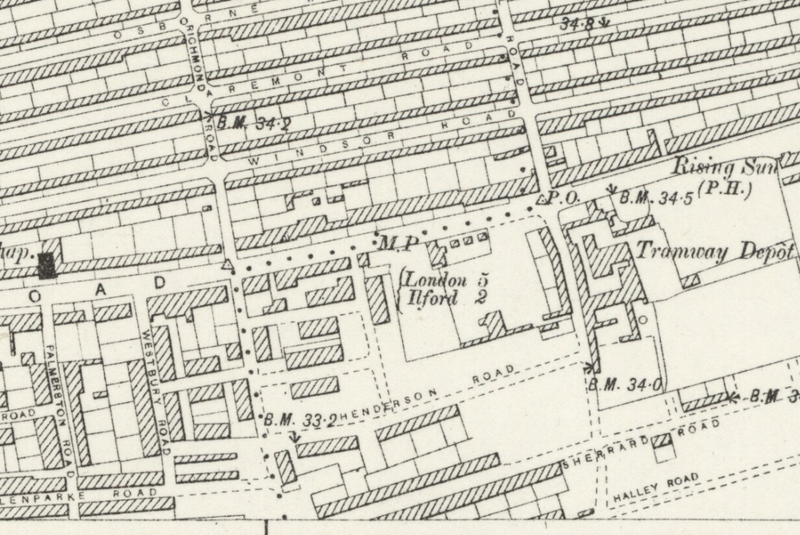 On the far left of the map is Emmanuel Church on Upton Lane built in 1852 and enlarged later in the Victorian period. Prospect House There seems little information on this. The Rising Sun pub sits at the top of Shrewsbury Road, and is locally listed by Newham Council. The same area in 1898 – what is noticeable is how much development has taken place in those 35 years. Plashet Hall has become a tramway depot – there was a sweet factory here later. North of the Romford Road the Woodgrange estate has been developed. 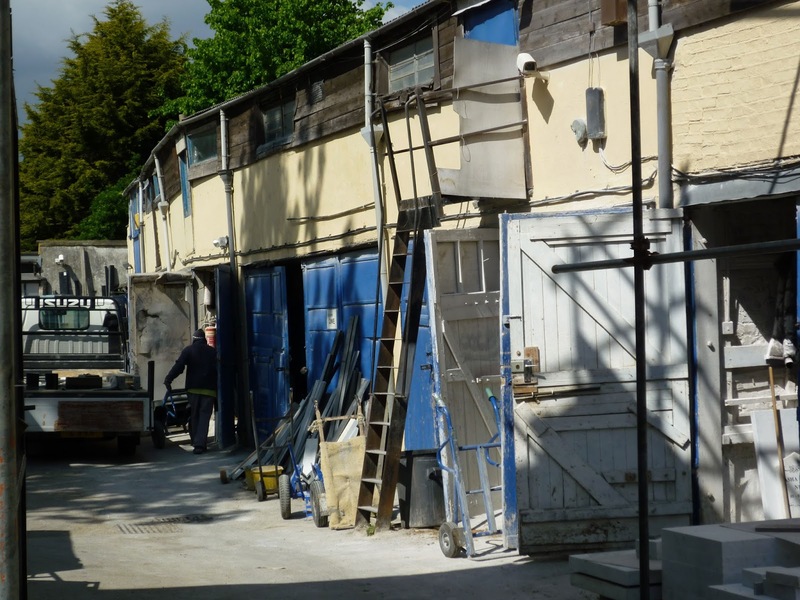 The current industrial buildings occupied by Elfes stonemasons co-incide with the old Ebor cottages – the estate simply excluded it (see here for an earlier blog on the estate). See below for more on Ebor. The estate included some larger detached houses as well as terraces. The Manor Park side of it, from Durham Road to Romford Road, was mostly completed about 1883, and the Forest Gate side, from Hampton Road to Romford Road (so far as this lay in East Ham) a few years later. South of Woodgrange, at Plashet, development began in 1883 with the sale of the Plashet House estate (between St. Stephen's Road and Plashet Grove). This estate, with adjoining parts of East and West Ham, became known as Upton Park. 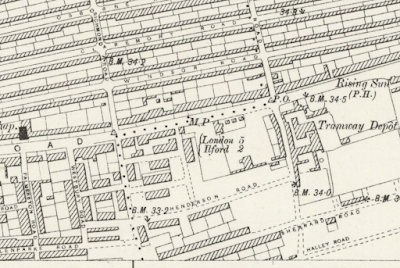 By 1890 building was in progress in the whole Plashet area from Green Street to High Street North, including the estates of Plashet Cottage (Grosvenor, Eversleigh, and Spencer Roads), Plashet Hall (Sherrard, Halley, Strone, and Monega Roads), and Wood House (between Woodhouse Grove and High Street North). See here. Rd Forest Gate – photo by Peter Williams May 2010. Ebor was, of course, the Roman name for what is now the city of York. Quite why the cottages in Forest Gate should have been given this name is unclear. Although what is now Romford Road, on which the cottages sat, is the route of the old Roman London - Colchester Road. The surviving Elfes buildings clearly look quite old and predate the surrounding Woodgrange estate and the shops fronting Romford Road, including the Claremont Clinic, and the nearby mosque. 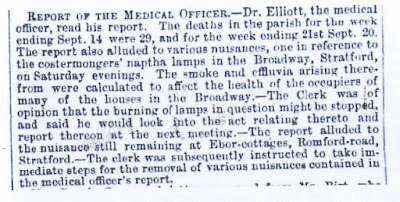 By the mid nineteenth century the cottages had become a fairly notorious slum area (see press clippings, below, for further evidence). In 1855, Alfred Dickens, brother of the novelist Charles was commissioned to conduct a survey into public health issues in and around West Ham. His report was damning and lead to the creation of local bodies designed to address some of the issues he highlighted. Ebor Cottages - these are at the eastern extremity of the parish of West Ham. There is no water. There used to be a pump, but it became rotten and broke down; the landlord refuses to replace or men it. The privies are overflowing and running to the surface. Near these cottages, in the front, and at the side of the Romford turnpike road, is an offensive stagnant ditch, full of all kinds of filth; a similar nuisance, at intervals is repeated all along this road. A considerable quantity of house drainage, including that from the Pawnbrokers Almshouse (ed: see here, for details), finds its way into these places. Even along Upton Place (Upton Road), where there are some handsome houses paying rents varying from £70 to £150 a year, no proper drainage is provided; and immediately facing them are these open ditches to the extent of full a quarter of a mile on both sides of the road. The Commissioners' scheme does not touch this part. There is another stinking ditch near the Three Pigeons public house (ed: now a Tesco local, on Romford Road, near the fire station, close to Stratford). It is very much complained of. what was "Irish Row" Romford Road. A little further along Romford Road are the cottages illustrated above. These are part of the Romford Road Conservation area. A two bed-roomed and modernised one was recently on the housing market for £450,000. A row of late Victorian shops, including the Post Office, opposite the Claremont Clinic, occupies the space between these old, surviving cottages and what is now Katherine Road. This is the site of what was previously known as "Irish Row" This was demolished as slums in the 1870's - 1880's, and replaced by the current shops. They appear on the 1863 OS map, above, but are certainly gone by 1898, and the shops have yet to be built by this time. During the first quarter of the nineteenth century, the land to the north and south of the Romford Road was undeveloped farmland. The First Edition Ordnance Survey map, published in 1844, confirms that this area was largely undeveloped during the first and much of the second quarter of the nineteenth century. These cottages do not appear on a map of the area published in 1839 but the occupiers of the houses are listed in the 1841 census. It is therefore logical to assume that the houses were built during the period 1839 - 40. A large house, called Potato Hall, was nearby and it may well be that these cottages were built for agricultural workers and were those locally known as ‘Irish Row’. It is clear that this official council document confuses Irish Row and the surviving cottages, which we now know are quite different buildings. 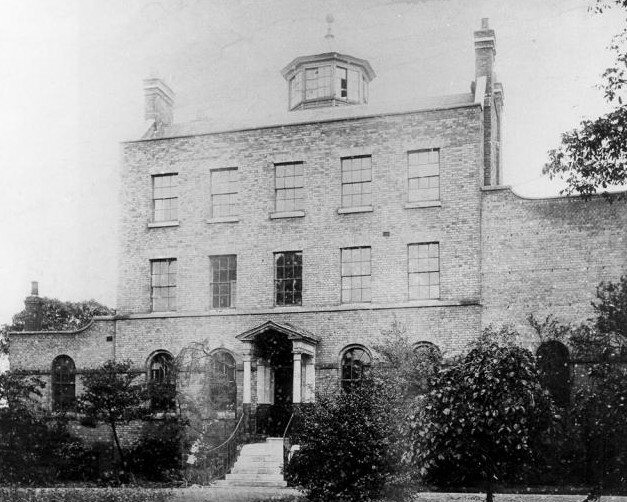 ... at eight o'clock on Thursday morning at Rokeby House (in central Stratford), the company took their seats and went forthwith to Ebor cottages on Romford road where they alighted and on reaching Gypsy Lane (the former name of Katherine Road), the first stone was beaten, and christened "Ashdown" after then name of the vestry clerk, who underwent the old custom of "bumping" nearly all of the company being bumped during the day; and by way of a finale the vestry clerk received thirteen bumps at the stone where the start was made. 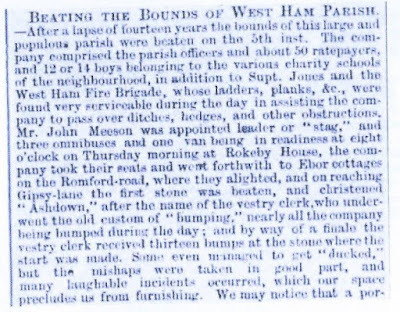 Ed: Beating the bounds was an ancient tradition and involved a procession from the parish church visiting the boundary stone markers at the parish boundaries, to ensure that they were still visible, and thus that the extent of the parish could be determined. You can still see one of these on the south side of Balmoral bridge, as you head north (see below). 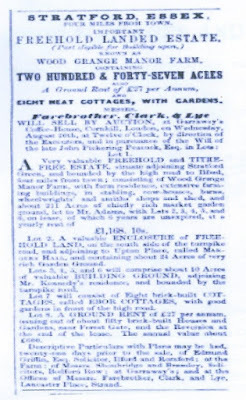 Chas Williams, a general dealer and Thomas Reynolds, both of Ebor Cottages, Romford Road, East Ham, were charged with stealing a donkey, valued at £2.10s, the property of Henry Rose, of the Broadway, Stratford. The donkey was stolen from a stable on the night of the 3rd of June, and on the 10th the prisoners sold it to a man named Mason. The prisoners were remanded. Report of the medical officer: Dr Elliott, the medical officer read his report. The deaths in the parish for the week ending Sept 134 were 20 and for the week ending 21st Sept, 20. ... 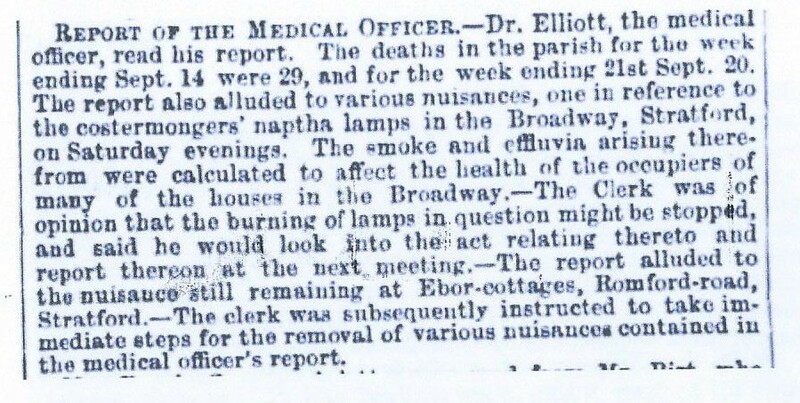 The report alluded to the nuisances still remaining at Ebor cottages, Romford Road, Stratford. The clerk was subsequently instructed to take immediate steps for the removal of various nuisances contained in the medical officer's report. 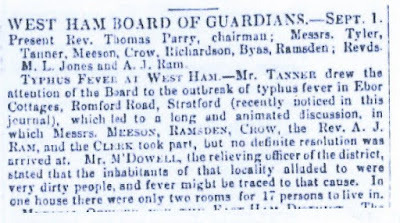 ...Mr Tanner drew the attention of the Board (of Guardians) to the outbreak of typhus fever in Ebor Cottages, Romford Road. 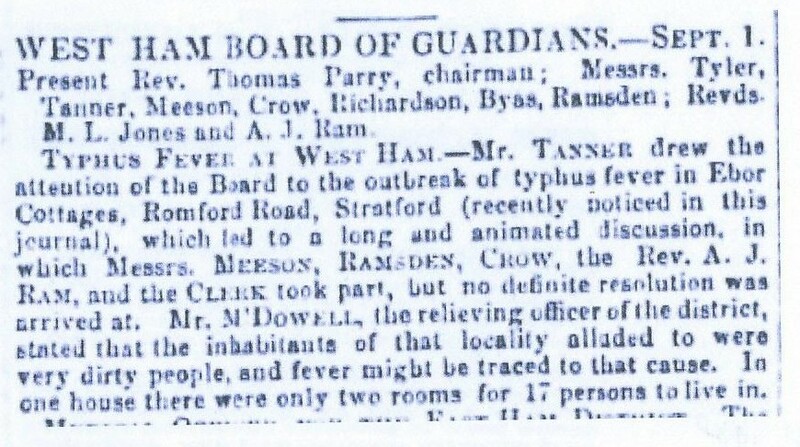 ... Mr McDowell, the relieving officer of the district stated that the inhabitants of the locality alluded to were very dirty people and fever might be traced to that cause. In one house there were only two rooms for 17 people to live in. Ed: Typhus was an infectious disease of poverty that Victorians began to tackle in earnest through the new science of public health. It was sometimes called "Irish Fever" and was noted for its virulence. It killed people of all social classes as lice were endemic and inescapable, but it hit particularly hard in the lower or "unwashed" social strata. The Medical Officer's Report: ... There were various nuisances requiring suppression, among which the animal charcoal factory at East Ham was the most prominent; so late as Saturday last the inmates in the houses Sun-row, Ilford-row were driven out by the stench and fetid smoke arising therefrom. The instantaneous removal of these works was strongly urged. Eight neat cottages with gardens. ...Lot 7 will consist of eight brick-built cottages (ED: i.e. Ebor Cottages), with good gardens to the front of the high road. 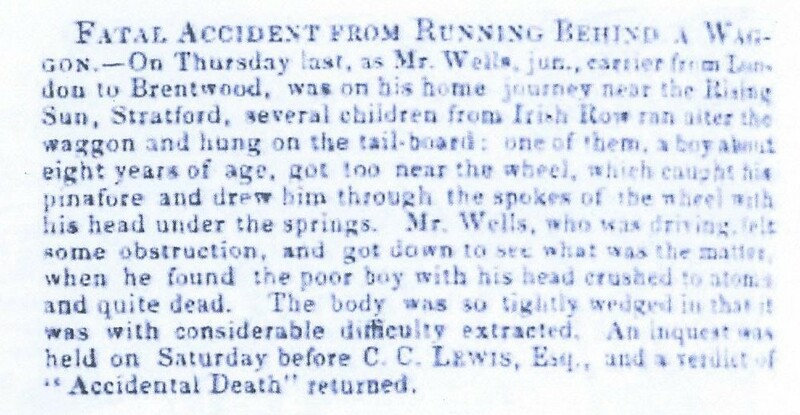 A fatal accident from running behind a wagon - on Thursday last, as Mr Wells jnr carrier from London to Brentwood was on his home journey near the Rising Sun, Stratford, several children from Irish Row ran after the wagon and hung on the tail-board: one of them, a boy about eight years of age, got too near the wheel, which caught his pinafore and drew him through the spokes of the wheel with his head under the springs. 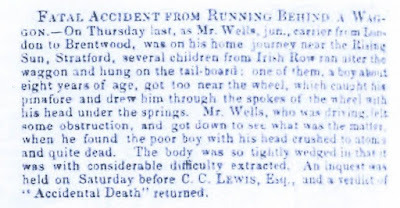 Mr Wells, who was driving, felt some obstruction, and got down to see what was the matter, when he found the poor boy with his head crushed to atoms and quite dead. The body was tightly wedged in that it was with considerable difficulty extracted. An inquest was held on Saturday before CC Lewis Esq, and a verdict of "Accidental Death" returned. Beerhouse Offence - Mrs Sarah Styles, beer house keeper, Irish Row, West Ham was convicted of having her house open for the sale of beer after eleven o'clock on the night of the 19th inst, and fined 10s and costs. Caution to carriers - On Tuesday night last, Mr Maunt, carrier from London to Hornchurch was conveying a box from the former to the latter place, containing a dressing case, jewelry, and ladies wardrobe, the property of the Rev C Row of Cranham, and although on nearing Irish Row, Forest Gate, at ten minutes past seven, he saw the box perfectly safe, and had gone only a few yards further when he missed it, nor could he find the least trace of it. Information was quickly given to the police and the same evening one of the metropolitan police force, K 342, found the box in an adjoining field, in the occupation of Mr Adams, farmer. It was broken open, and part of its contents, to the value of £10 had been abstracted.